Unlike the alimango which I ONLY buy when alive and fiesty, alimasag often come dead, or recently deceased, probably owing to their being caught in the sea and placed on ice perhaps for many hours before they make it to market. Also, they don’t seem too happy crawling about out of sea water, whereas an alimango on the loose can live up to several days in your cupboards or yard. Another way to enjoy alimasag is to add beer instead of lemons into the water at the bottom of the steamer, then sprinkle the crabs with lots and lots of Old Bay Seasoning (a mixture of spices which originated in or around Baltimore, I think), then cover an outdoor table with lots of manila paper, provide mallets and pour the freshly steamed crabs on the table and eat with gusto. Provide lemon wedges, vinegars, etc. and if Pinoy, of course some bowls of rice… :) You can also make rellenong alimasag, some crab torta, ubod with crab, crab, mayonnaise and dill spread, or just enjoy the patterns on the shells, if you have had your fill! im a goner MM…never learned to eat crabs from the shell. always at the losing end whenever we go to places where fresh crabs are aplenty. I’m off to Farmer’s Market in Cubao to get my alimasag! I remember when my sister and I were younger and sharing an apartment, someone gave her live crabs. She didn’t want to boil/ kill them. They were huge, lived in the kitchen and terrorized my cat. It was horrible. I don’t know what happened to them…Then there were the clams. But that’s another story. Because we live right next to the Pacific here in Camarines Norte, alimasag comes aplenty. At 60.00/kilo, it sure is a better buy compared to alimango which costs here about 280/kilo. My husband prefers it because it doesn’t have aligue and we presume, is less of a calorie bomb. I did not know bluecrabs are alimasag They are plentiful here in Houston and in North Carolina. Yeah you are right about the smells, I just bought a dozen of mud crabs last weekend, they are alive, but they are in a huge tray with some dead ones, and they smell.. I gave it to my daughter to steam and she said that they were not good. She gave me some, but I did not get to taste if it was fresh or not because she slatter so much oyster sauce in it. One tip about steaming crabs; put 1/2 cup of white vinegar in your steaming water, it not only takes the fishy smell out of your whole house, but it also makes the meat of the legs and pinchers easier to pick. 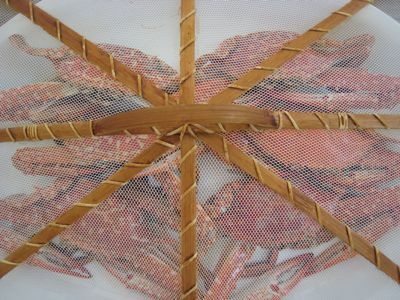 You can also tell if the blue crabs was fresh when it was cooked if the meat texture is firm and not mushy when eaten. Steamed alimasag, tortang alimasag and alimasag cooked in gata—-Yummy!Actually they taste better than alimango–tender, light and sweet. The few times that I have been home to Navotas, when i request for alimasag, my family would say, there is not much in the market, it is all sold out to the resto purveyors. same with pehe (talangka) or tatampal (shrimp mantis), but they always have sugpo or alimango, but I find the smaller shrimp and alimasag tastier and sweeter than those. 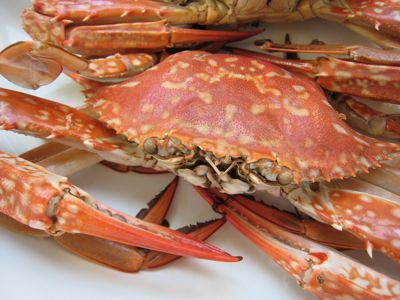 But here in the new England area, we have our choice of, blue crabs from the maryland shores, rock crabs from the Bay area and dingeness crabs from the northwest, then one have their fill of King crabs and snow crabs, a little expensive but worth it! and then when it softwhell crab season, they are so good, deef fried. i remember my Nanay buying those alimasag na luno which is the cheapest to make crabmeat omelet, now we know that thos alimasag na luno are delicacies here in the states. The rock crabs that we get here in new England does not have alige but it is so chock =full of sweet tasting tomalley and the meat is so sweet, although the shell is rock hard that you need a real hammer to get at the claw meat. But it’s the lobsters that makes the living here in new England the best, I can’t hardly wait for the summer time when the Lobsters get their soft shell and there is a lot of supply and the prices go down to as little as $2.99 a lb from the boats. This is when my daughter and I make our lobster feasts, paella with lobster, creamy style Boullaibase (pinoy style) with lobster, ginataang lobster, lobster salad on hotgrilled hot dog rolls, inihaw na lobster, tempura lobster, baked stuffed lobster with lobster. MM, I bet you miss your new england days? Molting alimasag of course provide us with soft-shell crabs, nature’s way of looking after people who lack the necessary patience and skill for picking the sweet morsels out of the shell. 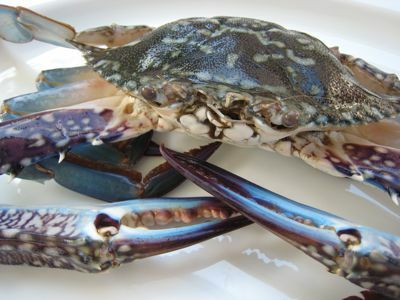 I grew up in Bataan and there is plenty of alimasag (blue crabs and there’s one called baklad)there. We usually eat it for breakfast. For faster cooking we just boil it with very little water and salt, no vinegar, no lemon. Where do you buy LIVE alimasag here in Metro Manila MM? I live in Baltimore – actually much of the iconic Maryland Blue Crab found in this area actually comes from the Philippines and Thailand – the Chesapeake Bay is all fished out. Philips Seafood – a resto chain and large frozen and canned fish products distributor – known, of course for its Blue Crab – sources from Southeast Asia – I read a big expose a couple of years back – will try to find the link. Many of Baltimore’s public school teachers and nurses (Johns Hopkins is the largest employer in the area) come from the Philippines – that we get our famous Blue Crab from the region – is very telling – Filipinos are the unsung heroes in this area and an essential fabric of our city! Oh i love crabs, dip in chili vinegar or melted butter with lots of fried garlic and chilies as well! I make sure that I have plenty of time in my hand when I eat crabs, I make sure there’s plenty of rice as well! :) I remember one time when I was maybe 8 or 9, my parents used to sell fish back home and they but the fish in Navotas, one time I woke up with 2 crabs crawling it’s way towards me! Creepy huh? skunkeye, funny you should mention the crab/maryland connection. It seems Philipps, one of the largest crabhouses in Baltimore, has a picking, packing and freezing/canning plant in Northern Cebu, near Bantayan. The crab meat is steamed, picked and packed in cans or frozen… I thought primarily for the Japanese market… but it turns out a lot of it is exported to the U.S. so yes, a lot of the meat in those chowders and possibly even the crab cakes are processed here! 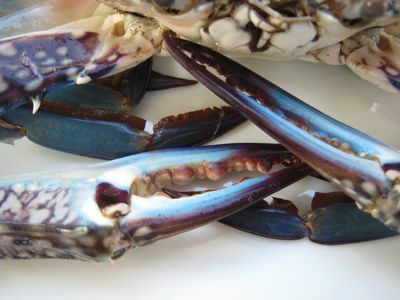 And the blue crabs are similar but not esactly the same… in the same way the typical native of Baltimore is human like a native of Mactan, but in many ways, are world’s apart… :) Thanks for the article! Joey, I have rarely seen any live alimasag at all, sometimes at Seaside in Baclaran. nina, yes, a quick boil works too, but I find some of the flavor excapes from the crab, that’s why I prefer to steam them over, not in the water. Apicio, I absolutely ADORE soft shell crabs… and once did a drive down the Maryland coast to a small restaurant and crab consolidator that had pens of crabs out back and when you ordered a soft shell crab, they would go out back and pick one and cook it for you… it was the best soft shell crab meal I have ever had… and that was perhaps 25+ years ago! They should call it Philipp-INES crabhouse! I have wonderful memories of going to the Philips restaurant on DC’s waterfront as kid – putting on a tie and jacket – the quality has declined signifacantly since then… the one on the harbor here is a tourist factory – all you can eat buffets and the like – not memorable food…you’re right there are differences bewteen the South East Asia blue crab and the Chespeake Bay variety but it does the trick for the canned and packaged goods I guess. My father visited the Bantayan farm actually years ago… I just hope the Philippines bklue crabs avoide getting over-fished. Local/Baltimore crab cakes are hit or miss – a lot of it is filler – but seems to be the thing to eat here. I myself prefer soft-shell crabs – especially the ones from the Tidewater VA/NC area where my family has a beach home. Better yet, I’d love to be in the Philippines eating blue crab. thank you for the great site!!! I went to Binondo last week and stumbled upon a seafood dealer along Soler Street. They had all kind of seafood, from huge lobsters and slipper lobsters to alimango and alimasag. The alimasag seemed to be brighter in color to the ones commonly seen in markets. I didn’t buy anything since the prices were way too high – P2,500 per kilo for the lobster and P500 for the alimango. I guess you have to be Chinese to be able to get a discount. The best crab recipe EVER? Thahn Long Crab of San Francisco. Saaaaraaaaap graaaaabeeeee! Heavenly oily/buttery, garlicky, peppery… Mahal nga lang- I spent about $60 per person for the meal which included their famous garlic noodles. They use dungeness crabs though which is inferior to our alimango. Had a local version done (special order/arrangement- not in the menu) in BF P’que’s Las Paellas a few months ago and it was so good I forgot I had company and did not talk until I was done with the huge alimango. Thanks MM for consistently whetting our appetites! may i suggest that when steaming the crab, position them in the pot in such a way that they lie on their back. that way, the juice oozing from the top crabs penetrates the body of the crabs beneath. The other position will just make the juices flow over their shell. hope this makes sense. You can buy pasteurized crab meat by Philip’s, MADE IN THE PHILIPPINES, from Costco. They’re not that bad considering that they’re canned. I use them to make crab cakes. Where can I buy Soft Shell Crabs in Manila? Alimasag is abundant too in the middle east,and they are big in sizes.We dont eat alimasag there if its not newly catch! day or night, we catch them anywhere in the beaches,sometimes, you needed only few minutes to fill a huge basket. you should bring gloves to avoid those dangerous claws too! we simply steam it or ginataan with some veges like pumpkin and sitaw,wow! nice to eat with minimal chilis on it..